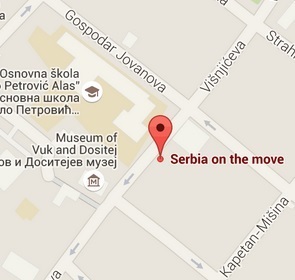 Serbia on the Move | Who are we? Our mission is to build a strong and responsible civil society by motivating individuals to take an active part in creating changes that will improve their lives. Every member of our society has the potential and energy they need to initiate the change. Citizens’ support –The association requires written support from 1,000 citizens before implementing each project it initiates. Community organizing – Each of our projects and activities depends on direct involvement of citizens in their realization. Transparency – All of our resources and expenditures are presented publicly and are available on our organization’s website under the section ‘Transparency’. If we were not able to publish this information, it would mean that we are not responsible to those for whom we exist. CSO Serbia on the Move was founded on July 4th, 2009 with the mission of empowering, motivating and encouraging individuals to be proactive and solidary in creating a more quality life in Serbia. We come from different social spheres, and among us there are political scientists, doctors, economists, lawyers, social scientists. We live in Serbia and we are determined to stay here. We do not want to move abroad searching for better lives. We spent our childhood watching our parents fight AGAINST something or someone. What has changed? Today we fight FOR ourselves and FOR our children. We wish to do whatever we can to make living in Serbia better, and not just in words, or in some distant future, but acting on it today! We are happy to see how we have grown and what we have achieved so far, but we are not happy with a variety of negative phenomena in our society. We believe that every individual has the capacities and resources to step up and make their life better; to make demands from the state, but also to do something for themselves and the state. WE, the citizens, create changes, we do not wait for others to do it on our behalf. BE A MOVER, NOT A PASSIVE OBSERVER! We believe it is important to see things as they are; to celebrate successes, and analyze failures; to be present in the moment, and think about activities in the context of what our goal is, not just do things out of habit or by default. The price of discipline is always smaller than the pain of regret. Every time I divert my eyes from the goal, I can see nothing but obstacles. Those who are not good enough tend to surround themselves with those who are worse than them, in order to make themselves look better. The best people want to work with those who are even better, so they can advance and learn. Through decisiveness we step up, get organized and change the world around us, we do not wait for others to do it for us. It takes courage to speak loudly about the things that are important, while others are silent about them. The right to think freely and make decisions without being pressured or blackmailed by others. The right to examine authority critically without suffering the consequences. Getting started is the first step to succeeding. A journey of a thousand miles begins with a single step. Change the world around you by changing yourself. In order to solve a problem, you need a genuine desire, and the belief that that the solution is possible. There are no limits – we set the limits ourselves. Being responsible means doing your job in the best possible way, so that you are continuously aware of the consequences of your (non-) doing. Taking over responsibility means standing by your actions and words, believing you are doing a right thing and having a clear vision of the goal. Everyone has an equal right to fulfill their potential and ambition as long as they don’t violate the right of others to do the same. One is motivated to take over the responsibility and take the initiative when he or she knows that the society will not favor others unfairly, or judge him or her falsely. People with a vision are the people who can tell which way the society should be going. Good leaders do not generate followers, they generate new leaders. The job of a leader is to bring out the potential in others and make them aware of it. This website has been developed under “I am not on the take, I work for the salary”, the project supported by the Institute for Sustainable Communities (ISC) through the “Civil Society Advocacy Initiative” program funded by USAID.